Kettle Cooked Chips provide a harder, firmer bite than the snappy mush of a Regular Potato Chip. These were no different The superior crunch was audible and sustained. As these were virtually the same Chip as the Original version in this range, we could not find a discernible difference to report upon, so this what we wrote... 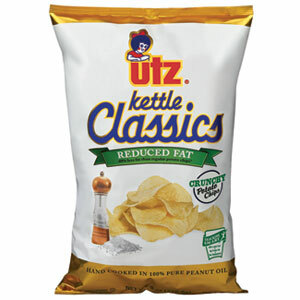 Although these Chips were Kettle Cooked there did not seem to be many folded, curly, or bent bag constituents. They looked slightly more thick than Regular Chips, but not significantly so. There was minimal seasoning visible and there were not many brown areas on the surface of the Chips. As you will find with the reviews of Regular, Plain, Unsalted etc., Chips, we do not find it easy to judge the difference between flavor-free Chips. We crave flavor, and like the Original version of these Chips, we could not really tell a difference between these and any another manufacturer's Plain Chips. They were maybe a little more tasty because of the peanut oil infusion, but aside from that, we are of the common belief that Chips without flavor need a sandwich to give them purpose.